How do open borders meaningfully differ from mainstream “immigration reform”? Co-blogger Vipul raised recently the question of whether pursuing the radical concept of open borders is really worth it, compared to just focusing on moderate “immigration reform”. Given I blog here, my response to Vipul’s question is not in doubt. But there’s a basic question I think we can easily overlook if we try to answer Vipul’s question based on gut feel: how do open borders differ from moderate “immigration reform” which most pro-immigration liberals across the world work towards? Here, I’ll outline: several starting premises that we all share; three important ways in which we fundamentally disagree; and finally, one important thing which we actually agree on (or at least, don’t disagree anywhere close to the degree it’s commonly imagined). At first glance, this seems trivial: open borders is a substantial or total dismantlement of existing border controls. Moderate liberal immigration reforms either seek to reinforce border controls while treating unlawfully-present immigrants better (e.g., most of the immigration reform proposals on the table in the US as of this writing) or minor loosening of border controls for certain types of people (e.g., proposals to allow for greater economic migration in certain job categories, or refrain from holding asylum-seekers in prisons). In other words, open borders supporters want to tear it all down, while moderate reformers simply want to selectively patch up or open certain parts. When you consider these points of agreement, it’s actually a wonder why these two groups of people advocating changes to our immigration systems land so far apart. Why do some embrace a completely radical view that concludes the whole edifice is rotten to its core, and must be fundamentally torn down and rebuilt, while others simply focus on what amount to tweaks — tweaks that no doubt affect the lives of millions, but remain almost infinitesimal compared to the changes which open borders might bring? Immigration is good for the economy? Awesome, why not allow as much immigration as people want to engage in? If a citizen wants to hire a foreigner, everyone benefits — so have at it! Immigration doesn’t threaten our society? Great, yet another reason we can shut down government programmes that spend billions “defending” our borders from restaurant cooks and IT workers, and divert those precious resources to better uses for our nation. Our immigration system treats millions of people as if they are subhuman? Seems like a good reason to begin shutting the whole thing down and replacing it with a more humane legal regime: we could just allow everyone who wants a visa to get one. Economist Bryan Caplan has made just this argument before, responding to the precautionary principle-based argument against open borders. Unfortunately, I’ve yet to meet a mainstream immigration reform advocate who openly takes such a position; the way most advocates talk, they’re happy to embrace empirical evidence which may support “immigration reform,” but shrink from any inexorable conclusion, no matter how firmly the evidence may point towards it, that open borders could possibly be the right thing to do. Most mainstream immigration liberals strike me as irrationally certain that the immigration status quo is backed by the evidence, and open borders aren’t — when actually just the opposite is true. But to give credit where credit is due, one of the few immigration liberals who has been willing to grapple with the tough question of open borders is Slate‘s Matt Yglesias, who had some pretty thoughtful things to say in response to criticism of open borders advocacy. On to the second important area of disagreement: are loose border controls a government “subsidy” for migration, or are they simply relaxation of the state’s control on an organic human activity? In discussing migration with many of my liberal friends or acquaintances, I find many inherently frame an open migration policy as a subsidy to migrants, artificially spurring human activity that only occurs because the state has encouraged it. This paradigm is why someone like say, Vivek Wadhwa so casually dismisses open borders as not a very meaningful source of empowerment — because in his view, migrants don’t actually want to move! In this worldview, loose border controls are a subsidy to migration: people don’t actually want to move in some platonic world, but by opening the borders a little, you’ve subsidised their migration, and so they’ll pack up and leave the only home they’ve ever known. I find this view very difficult to understand and almost as hard to rebut, because it seems so obviously self-refuting. Let’s say the government required you to apply for a permit before you were allowed to write any blog post. If government loosened the permit requirements, or abolished them altogether, would any sane person call this new blog permit policy a “subsidy” to bloggers? It is of course true that loosening border controls promotes migration. But this promotion of migration occurs as a result of migration flows being able to edge back towards their natural state. Returning to my example, you would see an immense spike in blog posts if government abolished the application fees for blogging permits. This abolition of fees would be a “promotion” of blogging in one obvious sense of the word, but it clearly is not a subsidy to blogging — it is a removal of one government barrier to blogging. In my opinion, seeing border controls as a government barrier, instead of just a natural state of the world, is one of the key differences between open borders advocates and mainstream reformers. If we treat borders as natural, and any loosening in their control as some sort of state “subsidy”, the right intuitive response would be skepticism. After all, a subsidy requires resources from the state. Even if no actual transfer payment is being made, government investment is required to effect the policy, and some prioritisation calls have to be made about the trade-offs of pursuing this particular subsidy or programme versus some other alternatives. This is why, when open borders comes up, some mainstream liberal in the room will almost always pipe up: “But what about all the problems we have in our country? Sure, we could invest in open borders and that’d raise world GDP, halve world inequality, etc., but don’t we owe it to our citizens to spend our scarce resources on solving their problems first?” The stereotypical open borders response to this might be to stare flabbergasted at someone who just suggested it is more important to spend money on, say, domestic farm subsidies than on aiding the escape of people fleeing genocide. But honestly, we don’t even have to do that. You can be a good citizenist and nationalist and still find this cliched liberal response totally unappealing — because it’s coming from the unintuitive and senseless view that loosening border controls constitute a subsidy, instead of a removal of a barrier. There is nothing natural about watertight controlled borders. Borders themselves are sometimes natural: rivers, mountain ranges, and so forth have marked out tracts of territory since time immemorial. Many borders are obviously artificial, drawn by some dead white man who might never have met anyone who lived on either side of the line he invented. Can we say that a system of brutal border enforcement truly serves the people’s interest, when these borders have often been drawn with utter disregard for the actual interests, welfare, or way of life of the people living on either side? Whether drawn artificially or naturally, borders sealed to a degree where virtually nobody can cross are an immense historical aberration. There is nothing natural or logical about assuming a watertight border and taking any loosening of that to be an artificial subsidy. Quite the opposite: our society has to invest an immense amount of resources in sealing our borders to a degree that we fancifully imagine to be somehow “natural”. The people suggesting that any loosening or opening of the borders would be a pull on the state’s or society’s limited resources are totally ignoring that tight border controls already pull immensely on our resources. Border guards do not work for free. Electrified fences do not build themselves. Prison camps for people fleeing war or economic disasters don’t spring out of nowhere. Plane tickets for deportees do not simply pay for themselves. Every dollar less that we can spend on deporting people or keeping them out is a dollar we can spend on a more deserving citizen here. There simply is no “investment” necessary to “subsidise” open borders. This pernicious view of sealed borders as natural, and loose borders as a subsidy for migration, directly ties to the third fundamental disagreement: open borders advocates hold state-enforced border controls to a much higher bar for ethical legitimacy than moderate reformers do. Most moderate reformers are not very ethically- or morally-bothered by immigration laws. A lot of the passionate moderate reformers I’ve encountered are bothered by these laws primarily to the degree that they affect people they know: in other words, migrants who are already present in the country. Open borders advocates on the other hand seem oddly-motivated and passionate about all the prospective migrants who aren’t even here yet, and, if we don’t open the borders, will never come. But this is because moderate reformers see sealed borders as a state of nature, and any loosening of the border as a subsidy to targeted classes of migrants. Consequently, they aren’t interested in open borders, which seem like an untargeted subsidy: it seems infinitely costly, and it’s not clear what the return on what seems like an infinite investment would actually be. Moderate reformers want the “subsidy” of looser border controls to focus on groups they can immediately see as deserving target beneficiaries: children of illegal immigrants, some illegal immigrants, refugees, high-skilled workers. They don’t see much reason to care about other possible classes of migrants, since that’d be diverting the scarce resources necessary to enact the “subsidies” they’re seeking for these classes of migrants. It’s not morally- or ethically-important to consider people outside these narrow classes: sealed borders are the natural state of things, and it doesn’t make sense to invest resources in opening the borders to unskilled day labourers. The onus is on these “economic migrants” to prove why it’s worth investing in opening the borders to them. Open borders advocates on the other hand find it ethically abhorrent to insist on removing barriers to organic human movement for certain classes of people, but not others. Why treat a refugee fleeing genocide so differently from another refugee fleeing famine, or another refugee fleeing economic collapse? What is the morally-relevant difference? If we allow refugees from one dictatorship open borders, but not refugees from other dictatorships, what morally-relevant reason is there? The key difference is that moderates find arbitrary restriction of movement across borders totally ethically acceptable: of course it’s okay for the state to ban you from crossing if you don’t have a university degree, because we shouldn’t be investing scarce resources in subsidising migration for people like you. Open borders advocates reach a completely opposite conclusion: it’s completely ethically unacceptable for the state to do this arbitrarily. Allowing you to cross the border is not a subsidy to you; it is a loosening of an artificial government restriction. If you want to look for work here, come shop, go for a walk, whatever, the onus is on the state to show why your doing this would impose unacceptable costs that require you to be refused entry. The different ethical bars that state controls over migration are held to here follow completely from the “subsidy versus felling a barrier” paradigm clash. And open borders advocates then go one step further to say: in most cases, there is no such unacceptable cost to society from allowing the person entry, and as such, there is no permissible reason for the state to refuse them entry. This follows entirely from the first disagreement: the evidence is overwhelming that in general, immigration is beneficial. To the extent the state refuses foreigners entry, it must narrowly target these refusals to the exceptions of the general rule that immigration benefits the economy and society. This brings us to my last promised point: that in one respect, open borders advocates and moderates are not really that far apart. Except for no-borders advocates and anarchists, most of us sympathetic to open borders will grant the state the authority to regulate and control border crossings. I’ve drawn an analogy to trade in the past: nobody thinks “free trade” means that I should be able to import AK-47s at will. Governments control many aspects of movement and life. If you are carrying bird flu, as a general rule you should not expect freedom of movement, domestically or internationally. Open borders is not about allowing armed soldiers or criminal gangs to cross sovereign borders at their whim. Open borders is about allowing innocent people, who want nothing more than to seek a better life, to cross sovereign borders in peace. I don’t think we need to tear down all border checkpoints in the world to achieve open borders. It would be perfectly feasible to maintain border checkpoints in an open borders world: you’d simply approve every visa application unless evidence arises that the applicant has malicious intent, or otherwise is a person who poses a significant and meaningful threat to your society. The vast majority of migrants in the world today, actual and prospective, neither have malicious intent, nor do they pose a threat to us. The social science shows that their coming here would benefit our economy. They wouldn’t undermine the foundations of our society. Preventing them from coming as if they are an invading army causes a disproportionate use of state force which violates basic human rights and common sense: in what way is it reasonable to bring warships to bear on refugees fleeing mass murder, or use gunships and drones to turn back people looking for a kitchen job that pays minimum wage? Unsealing our world’s borders would not be an untargeted, infinitely-costly subsidy to the migrants of the world, nor would it eliminate a fundamental natural feature of our states: it would simply free up billions of dollars for us to spend on our own citizens in more enriching ways, and allow millions of people to put their talents to better use serving us and each other. Open borders is a radical idea — and we should absolutely move towards it. 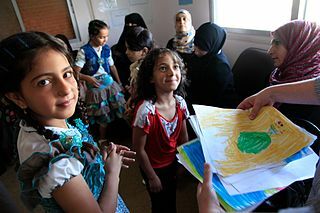 The photograph of Syrian refugee children in Jordan that appears above this post was taken by Russell Watkins, and is licensed under the Creative Commons Attribution licence. How do open borders meaningfully differ from mainstream “immigration reform”? is licensed by John Lee under a Creative Commons Attribution 3.0 Unported License.